It sometimes feels like the economic odds are insurmountable for the average American family. The recovery doesn't seem to be coming fast enough. The wealthiest few are getting richer while most Americans' wages are actually declining. How do we move forward? Rebuilding the middle class is a pretty big order. Luckily, we already have the tools to do it, and an American public ready to take the steps necessary. When times are tough, unions have always been the path to improving incomes and building a better life for working families, and today is no exception. 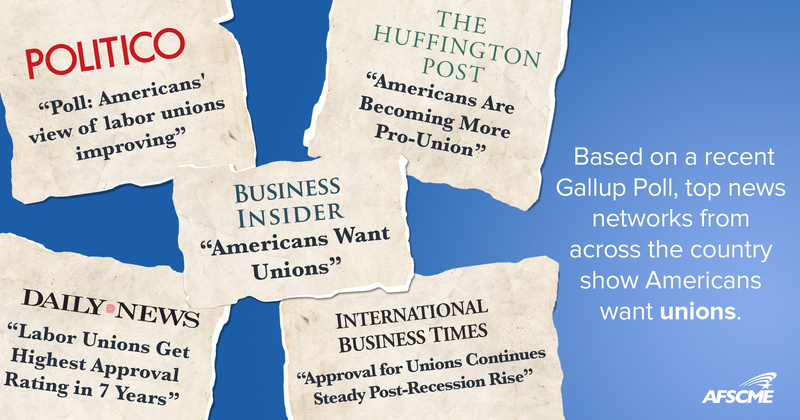 That was confirmed in a recent poll from Gallup, which shows that Americans are once again looking to unions as a solution to our broken economy. The financial crisis and recession led to a nationwide loss of faith in the CEOs and wealthy investors who had been driving the economy. Americans are calling for a more balanced economy, where the super-rich aren't calling all the shots. Since 2008, the public approval of unions has climbed 10 points, to nearly 60 percent. And a plurality -- 37 percent -- believe that unions ought to have more influence than they do now. Women, people of color and people under the age of 35 have the most positive views of unions. These are some of the groups that face the most inequality in this economy, and they're the same groups that benefit most from having a union. Black women who belong to unions earn 34 percent more than their nonunion counterparts, and Latina women make 46 percent more. While more and more Americans have positive feelings about unions, fewer people actually belong to a union. That means there are millions of workers in this country who are still waiting for the better wages, increased flexibility, and improved quality of life that come with union membership. In fact, when workers are allowed to form strong unions and negotiate for better conditions, our entire economy benefits. Unfortunately, things are getting harder for workers who want to organize. Many states have passed so-called "right-to-work" laws that do nothing but make it harder to form a union. Others have limited collective bargaining rights. Many of the current presidential candidates are avowedly anti-union. And next year, the U.S. Supreme Court will take on a case called Friedrichs v. California Teachers Association, which could harm public service workers and the communities they serve even more. But if trends in public opinion continue, the union-busting politicians are in for some serious trouble. The 2016 electorate will be the most diverse in history, and those women and young voters will be wielding a big influence. They're looking for candidates whose policies can give working families a place at the table again. Middle-class families deserve a voice and they deserve a fair shake in our economy. We can't do that unless we have the means to speak up for ourselves and each other, and to do that we need strong unions. It's just common sense, and the American people know it.